Last year I became aware of a British performer named Maria Friedman when a start-up theatre company in West Texas booked her to play "Mama Rose" in Gypsy for its inaugural season. Maria had never performed in musical theatre in the US and West Texas had never had much of a theatre scene, much less one as ambitious as this was to be. Alas, the theatre didn't make it, but Maria did. She made her Broadway debut in The Woman in White earlier this season on Broadway. By the time I made up my mind to see the show, Maria was often out of the show due to a fight with breast cancer and then unfortunately, the show did not last long enough for her go back in. However, I became impressed with her work through listening to her in the 1996 London cast recording of Sondheim's Passion in which she played "Fosca" as well as her appearance in the "Hey Mr. Producer" concert dvd. Maria is great friends with Mr. Sondheim himself, and even named his as her son's godfather. Being Sondheimish, how could I resist being devoted such a diva? Besides, she has a downright gorgeous voice and is one of the extraordinary actresses who sings. 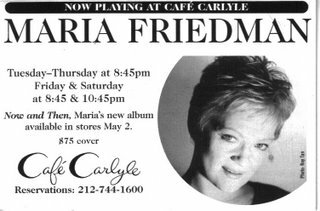 Tonight, Noah and I treated ourselves to our first trip to the famed Cafe Carlyle to see Maria in her all-Sondheim cabaret. She sang beautifully and was in the moment of every song. She treated us to some obscure Sondheim songs like "I Remember" from Evening Primrose and "I Must Be Dreaming" which he wrote as a 19 year old college student. She shared her "Fosca" from Passion with us as well as her enchanting "Dot" from Sunday in the Park with George. She is truly a warm and charming performer and I couldn't be happier with my first visit to the Cafe Carlyle. Sarah, Maria performed as the narator in a film version of "Joseph" with Donny Osmond in the lead role, you should check it out.